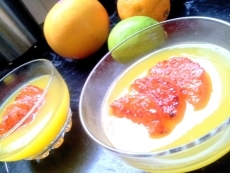 Have you made Caramelised Oranges? 1. 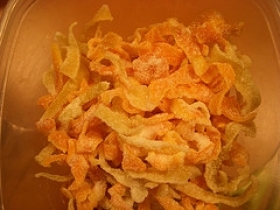 Slice the peeled oranges horizontally. 2. Secure the pieces in their original shape with cocktail sticks and set aside. 3. Pour the sugar into a pan and allow to caramelize on a low heat for 5-7 minutes, until it goes brown. 4. Be careful not to allow the sugar to burn, because it will become very bitter. 5. Pour about 10floz of water into the heated sugar pan, letting it melt the sugar that will have crystallized. 6. Stir until the sugar has dissolved. Place the oranges into a bowl and pour the melted caramel over the top. This recipe is high in Vitamin C with 94% of your daily recommended intake per serving.